Davenport Park has a full scale, antique carousel offering rides for little ones 7 days a week all year round for $1 per ride. It is so quaint, and wonderful to see the little kids really enjoying the carousel! This park has a very nice playground area with a nice shaded tree canopy covering the many picnic table areas. The climbing structure is very nice and has some interesting, and fun things for kids to do. The play structure was funded by a non profit foundation in memory of Kourtney Nicole Schmidt, who lost her life at the age of 10 months to Spinal Macular Atrophy. Her remarkable parents, who were grieving, decided to set up a foundation in her honor to do something good for the community. The foundation created the play structure inside Davenport Park. 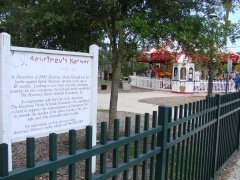 It is called Kourtney's Korner, and is fully handicapped accessible, meaning a wheelchair can go right up the ramp and kids can play with some fun interactive things up at the top of the structure. I like this park because it is fully enclosed with a fence, so little ones cannot escape into the surrounding roads. I also like this park because right next to it is the St. John's County Public Library, so you can visit the library the same day as your park visit, and get two interesting adventures in one day! Thank you St. Augustine, and the Kourtney Nicole Schmidt Foudation for this wonderful play place for our little ones! Come see a video tour!